And of course, once I received them in the mail I procrastinated because trying on super tight pants and taking photos of them wasn’t super motivating to me ha! But last week I gave myself a proper pep talk, and David was able to take some photos for me. They ARE a tad bit too tight in the belly area, but I was actually surprised by how comfy they were everywhere else! and I actually prefer the new style by a lot. So what makes them so good/different? 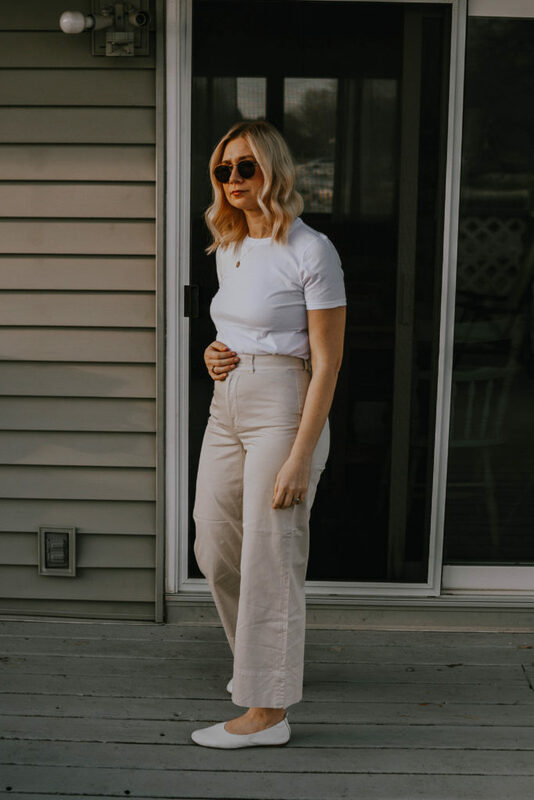 The new chinos are much more lightweight than the old wide leg crops. The material is a lot thinner, and a lot less bulky. I do love the weight of the old style in deep winter, but the new chino’s will be able to be worn year round. Plus, the chinos have 1% less elastane than the wide leg crops and even that small amount makes a big difference. I find that these feel more structured and flattering even though they are less stretchy. 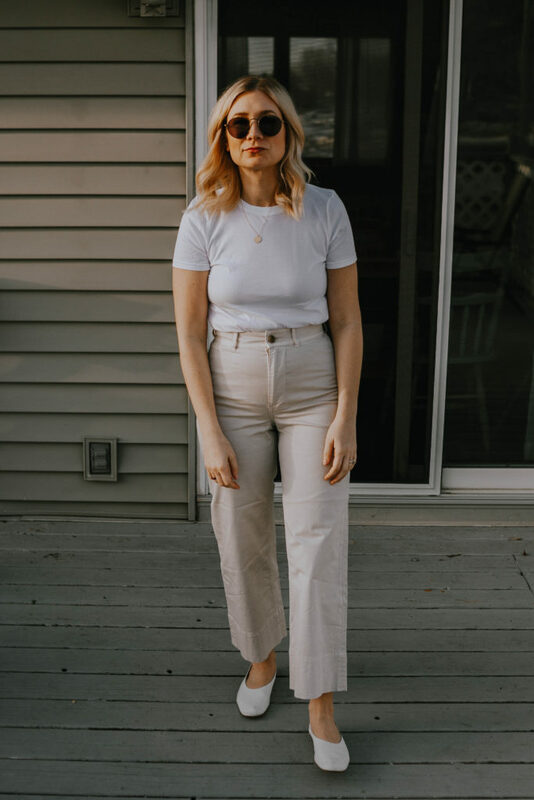 For me, when it comes to a crisp wide leg style, I don’t want them to be super stretchy. But the lightweight fabric is still super comfy. This may seem like a small thing, but the updated pocket style is actually a huge improvement in my opinion. 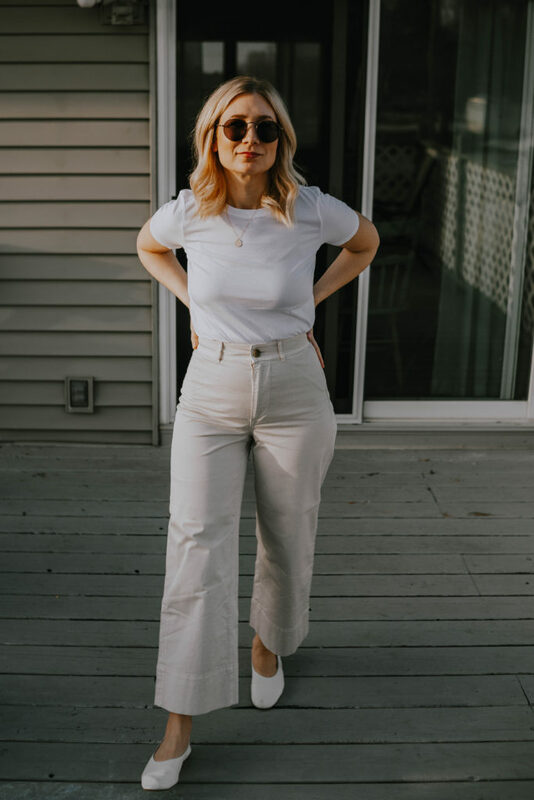 My one major beef with the old style was that the side pockets tended to bag out and make my hips look more wide than they actually are. 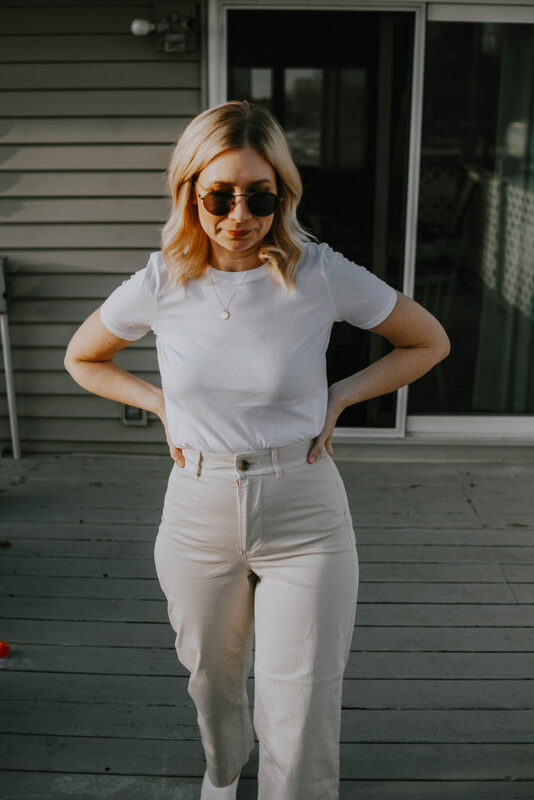 I often found myself wishing for a flatter pocket… and the new chino delivers in a major way! The new welt pockets are still available to you if you need them, but they don’t change the shape of the pant and create a much smoother front. The chinos also don’t have a back pocket, which may bother some of you, but I also really prefer. Overall, I love that the pockets (or lack thereof) lend to a much smoother fit. 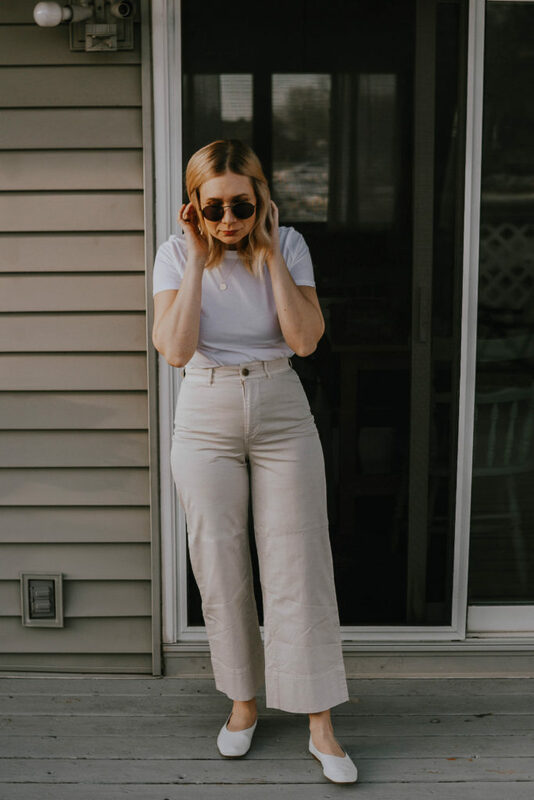 The added length, and wide leg hem also add just a touch of something extra special to them. It adds just the right amount of visual interest that I love. I also love the colored button at the front. It just looks a bit more modern than the metal button on the original wide leg pair. And finally the darts on either side of the back seam make for a very flattering fit on the buttage area. I’m honestly a huge fan of the new style, and I’m now contemplating selling my original pair and replacing them with the ochre colored chinos. If you weren’t a huge fan of the original style, I would definitely give these a shot. As with the original style, they do run big so I would size down. I’m typically a size 4, and I went down to a size 2. They’re available in sizes 00-16, and come in 5 different colors. They cost $68. You can purchase them here. Let me know if you have any specific questions, and I will try to answer them as quickly as possible! Oh and I’m also wearing their new cotton crew in white, and the day glove which I have a review of here.